Looking for ways to increase the performance of your SEO campaign? 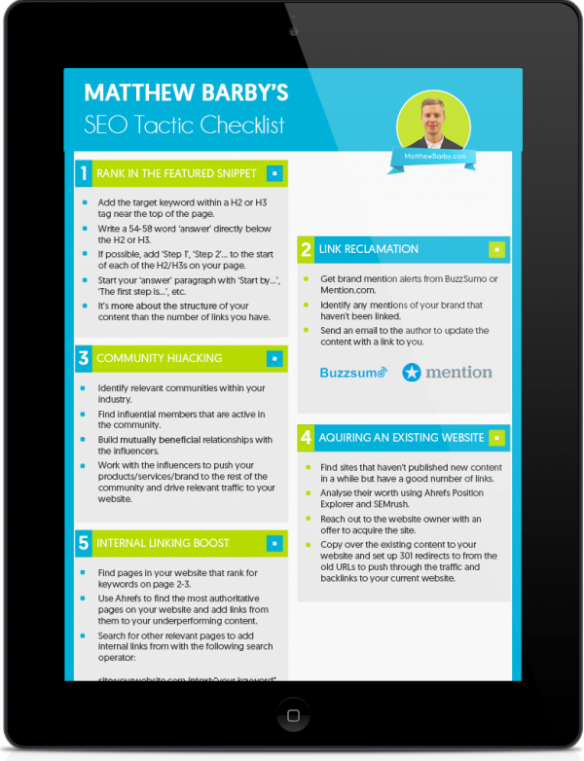 Download my checklist and work through my 19 different SEO tactics that you can implement right away. Plus, get a bonus list of the tools I use. Get instant access to my SEO tactics checklist and start generating more organic traffic to your website today. Get a step-by-step breakdown of each individual SEO tactic that you can implement to get results from your campaign. Each of the SEO tactics can be printed out and shared with the rest of your team, along with an overview of the instructions and tools needs to implement. 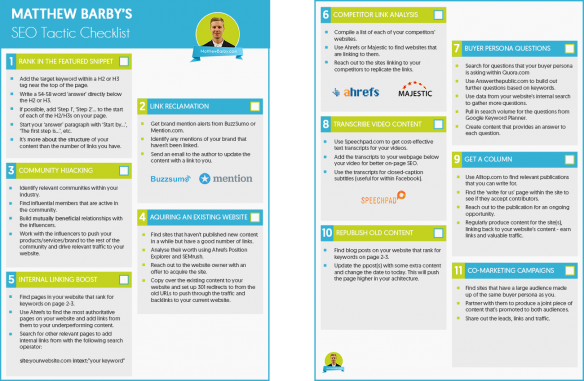 I've shared some of my best SEO tactics within the checklist. For any campaign that you're working on you can use this checklist as your campaign blueprint to get results. Matt doubled our revenue in less than 12 months. When Matt writes a new post I drop everything and read it. He is thorough, structured, and actionable with every post and more importantly I learn something I've never read elsewhere every time. Need some inspiration for the design of the call-to-actions across your website? Well, I’ve pulled together 61 of my favourite CTAs that convert really well.